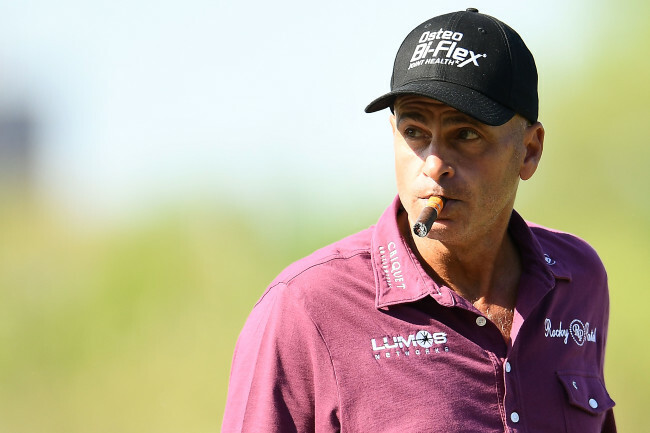 Rocco Mediate shocked the golf world last week when he revealed in an interview that he regularly drank on the course while competing on the PGA Tour. The Pennsylvania native, best known for going toe-to-toe with Tiger Woods in a Monday playoff at the 2008 U.S. Open, explained that the liquor helped to numb the back pain he suffered from throughout his career. Mediate described himself as a “habitual alcoholic” in the interview and said that his wife helped him get sober in October 2017, following a season of on-course struggles with his game and off-course struggles with his addiction. “It was just normal for me—a daily ritual, let’s say,” said Mediate. “You can put it in a lot of places . . . a lot of places. Was it every time? No. But most of the time when the pain came in, it wasn’t not going to happen.” The stats do show that Mediate has been playing considerably better since kicking the habit. In 2017, he had only one Top-10 and three Top-25s in 18 starts. Since that time, however, Mediate has racked up seven Top-10s and 12 Top-25s in 24 starts and seems to be in a much healthier headspace! The most notable round of the week did not come from the PGA, LPGA, or Euro Tours. Instead, it occurred in a Monday qualifier for the Oasis Championship, a PGA Tour Champions event that was played in Boca Raton, Florida, over the weekend. It was there that Don Bell, a 55-year-old real estate agent and native Floridian, earned both medalist honours and a spot in the field with his round of 64. It wasn’t Bell’s final score that merited his inclusion in this week’s Shag Bag, but rather his final nine holes, during which time he turned into a human buzz saw and cut down the rest of the competition. After making the turn in 36 strokes, Bell made birdies on each of his next seven holes. He then added one more birdie—his ninth of the day—on the 18th hole to secure his 64 and lock down one of four entry spots to last week’s event. “It was definitely the best nine holes of my life,” he said after the round. “It was a lot of fun and I’m hoping it’ll boost my confidence. When I start to doubt, I can look at that scorecard and all those circles.” Bell carried his momentum into the first round of the Oasis Championship, shooting a 3-under 69 and finishing the day tied for 21st place but ultimately finished the tournament in a tie for 60th after carding rounds of 76 and 74 on the weekend. Regardless of the result, it was a heck of a week for the real estate agent. Let’s hope it translates into some future success for him on the housing market. Watch your backs, Honma and PXG . . . Bentley is encroaching on your territories. The British car manufacturer announced last week that it will be releasing 100 sets of limited-edition golf clubs to commemorate the company’s 100th anniversary. Each set will cost a mere $16,000 and come equipped with signature “diamond knurling”-etched grips, Le Mans model miniature hub caps placed in the grip ends, and miniature “Bentley B” screws positioned in the club heads of the driver, fairway woods and utility club/hybrid. If those features aren’t enough to tickle your fancy, perhaps the gold thread woven into the carbon fibre club heads will. Another neat thing about these exorbitantly priced clubs is that the shafts for the drivers, fairway woods and utility club/hybrid are all interchangeable, although we’re not exactly sure how that will work. The set also comes with a black and copper leather golf bag and matching headcovers but no balls, which is kind of ridiculous given the price tag! While playing in his second round at Spyglass Hill on Friday, Phil Mickelson hit one of the best recovery shots you will ever see after yanking his drive into the right rough and behind a tree on the par-5 14th. Rather than laying up onto the fairway, the southpaw took out his 3-wood and curled a missile around the tree and over the water protecting the green to about six feet from the pin. Unfortunately, he missed the eagle putt. Everything you do on the golf course has consequences. Next time someone yells, “Duck”, this guy may just ignore it. There's always that one person at the driving range that has no idea what they are doing.